Since bathrooms are spaces that we use every day, their importance is far greater than we give it credit for. We have started to see more and more interior designers started to replace master bathroom with a spa-like bathroom to provide ultimate relaxation getaway from the stress of our busy life. Free-standing bathtubs centered in a bay window, Walk-in showers with steam showers, multiple shower heads, a hand-held sprayer, a bench and even a stereo system, Onyx and/or Wood walls for relaxing backdrops are few features in spa-like bathrooms. In a basic sense, stairs exist to connect floors on a house or a building. Besides their functionalities, they can be focal points for whole interior design. Staircases are “new” sculptures in the modern houses. With usage of glass panels, metal railings, steel ropes uniquely designed staircases can lift your renovation to the next level. Photo by Cody Anderson Wasney Architects, Inc. 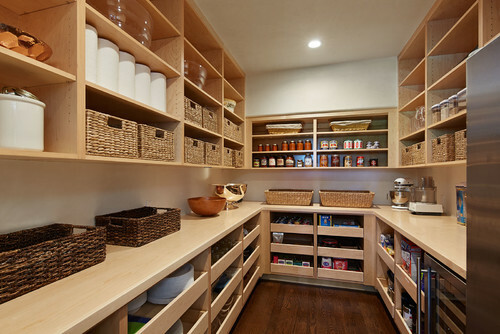 The pantry is making a comeback and is my favorite feature. Whether you are an aspiring cook or are stocking up for the long summer holidays, ample space to store all your ingredients can help with meal planning and make the decision of what to make for an unplanned dinner much simpler. 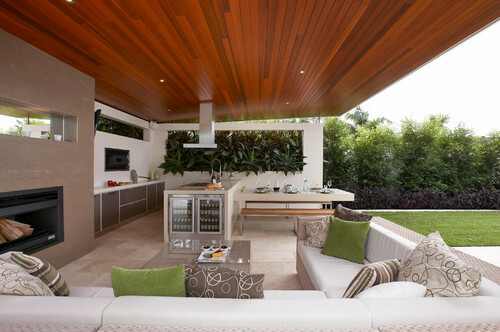 Your backyard is part of your home as well, so why not make the outside of your home as comfortable as the inside? Patios that include features like an outdoor kitchen, fire pit, fireplace, and lounge seating are becoming more popular.